You could call a Crest Bike Parts Clean and Lube System the perfect employee. The system cleans and lubes bike parts ultrasonically, day in and day out, without complaint. Plus, it frees up an employee to perform other bicycle maintenance tasks. A Crest Bike Parts Clean and Lube System is an all-in-one system that eliminates contaminates in bicycle parts in 10 minutes. Just turn on the Crest ultrasonic cleaner, drop the parts in the special water-based, bio-degradable cleaner, let set for five minutes, blow off, then move to the lube station. Leave for five minutes, blow off again, and the cleaning is complete. The parts come out entirely clean and with a thin film of a light lube  more efficient and much faster than by hand. And there are four systems in which to choose from. This is the ultimate workhorse system. Built to top industrial standards (14ga 316L bright annealed stainless steel), it cleans and lubes simultaneously thereby saving time; features three chambers  two deep mesh baskets and one drip chamber  which means a higher volume of parts can be serviced; an adjustable heat and timer unit for more controlled cleaning; a variable power generator along with chamber covers; allows for recycling the lube and chemicals which saves money; and comes complete with two gallons of lubricant and one gallon of Crest's special water-based, bio-degradable cleaner. It's like having an extra employee that does nothing but the dirty work, and does it extremely well. MSRP: $3,995 (A $2,000 savings on comparable units.) Plus, for a limited time, the Crest BC3-575HT-CP can be purchased via a three-payment plan by qualified shops. Made of stamped stainless steel, this unit will clean and lube simultaneously, features a heated tank, two deep mesh baskets, and two gallons of lubricant and one gallon of Crest's special water-based, bio-degradable cleaner. MSRP: $2,100. Crest BC1100HT - NEW !! New to the Crest line, this smaller unit features heated 8" deep tank, two HD deep mesh baskets with drain feature, cleans and lube separately, and comes with three gallons of lubricant and one gallon of cleaner. Special introductory price: $1,955. 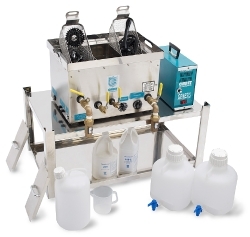 Introductory unit that features heated tank, two mesh baskets, and one gallon of cleaner and two gallons of lubricant. MSRP: $995. In addition to freeing up employees from the tedious task of cleaning bike parts, each Crest system performs its tasks economically. A drive train costs about 75º to clean and lube, and a chain, around a quarter. In addition, the add-on Conservation Package for the Crest BC3-575HT-CP allows for recycling of the cleaning solution and lube which drops the per parts cleaning cost by two-thirds. Says Greg Infante, President of CMR Sales, Inc., Crest's exclusive distributor to the bicycle market: "We have negotiated from Crest lower prices for the bicycle industry which means the units are extremely affordable. Especially when you take into account the savings realized of not having to pay an employee to solely clean bicycle parts. A comparable industrial unit from another manufactures would add 40% to 50% to the cost. But the one thing we are hearing is that more and more IBDs say that their Crest systems have paid for themselves over and over again." For more information, contact CMR Sales, Inc. at 1-877-254-7939 or email Greg Infante at greg@bikecleaners.com. CMR Sales Inc. is the exclusive distributor of the Crest Ultrasonic Firearm Clean & Lube Systems and Bike Parts Clean & Lube Systems for over 10 years. The company's president has over 14 years experience of ultrasonic cleaning in various industries. For more information go to www.bikecleaners.com.